Welcome to JJ-365 Salutes. Over 2018, we pay tribute daily to one of “The Good Ones”. Today we are shining the light on Jacquie Donaldson. When in Vancouver on my second watch there, the job was as GM of the CORUS Radio Network and the four radio stations. On the FM it was ROCK 101 and the FOX, and on the AM it was CKNW and AM 730. The 730 frequency was a sports station when I arrived, and it didn’t take long to understand, being the second sports station in a market that could only support one at the time, that we needed to visit other options. The higher powers in the company had the idea that whatever way we decided to would render millions and millions of revenue dollars. A big part of my job through this was finding something that would have listener attraction, avoid the money drain, make the station profitable, and keep head office thinking somewhat realistic in their expectations. Not without internal pressure to NOT do this, we flipped the station over to “All Traffic, All the Time”. The traffic in Vancouver is so bad, we put a traffic and weather station (and nothing else) on the air. Many in radio thought we were crazy but the bleeding stopped, it started to make some money and still is a worthy choice when you are on the roads in the area. What has this got to do with Jacquie? She was the News and Program Director of one of our competitors being the Rogers AM station ALL NEWS 1130 WX in Vancouver, their version of the wildly successful 680 CFTR Toronto. I studied this format for a long time and knew from all the research and my gut that the two key ingredients in the hot sauce for the success of those stations was “Traffic and Weather together” (a phrase that got coined by 365’er Keith James back in the CHAM-ster days. Ironically Jacquie worked for Keith during the CISS Country Toronto tenure). At 730 we cut to the chase of the Traffic and Weather elements (“you never have to wait for Traffic”) with the strategy also including supplying traffic aidop to all of our CORUS west coast stations and being the firewall for CKNW to help keep the evil 1130 from tearing its ratings down- 😊. I knew all about Jacquie from many of my co-horts in the business including 365’er Cliff Dumas and had her in the talent bank. I reached out to her to have coffee or lunch, she accepted and then we got together and talked about the business and all a few times. I was/am very impressed with her and if the job at CKNW/AM 730 had of come up, she would have been one of my first choices. She is super bright, knowledgeable, strong, competitive and a hard working and focused leader. I thought that WX was an extremely well-run radio station, a reflection of its leader. I knew that 730 was not going to knock that station off, rather carve out its own a small niche, protect ‘NW and at the very least slow down the growth of WX. Under her leadership they continued to grow anyway, we did well and at the end of day all of us activated more listening to AM radio in the market. Jacquie loved radio since she was a kid in Scotland, listening to Mrs. Dale’s Diary on her gran’s gigantic wooden console radio. After high school she chose the university path but it wasn’t doing it for her, so a friend suggested the Mohawk College radio program telling Jacquie “because you like to talk so much”. The lightbulb went on on her first day there and stayed lit for the rest of career. Jacquie started as a DJ doing the all-night disco show at CKAR/CKQT in Oshawa, but the news bug bit her early on and once she moved to Calgary to work for Wayne Bryant at Moffat, it was news and also co-hosting. One of her great career thrills was doing the morning show at FM96 in Calgary with the late and great Kevin Nelson who was brilliant. As a kid like many of us, growing up Jacquie had been a fan of Kevin’s dad, the late and great Jungle Jay Nelson of 1050 CHUM fame. Another highlight for her she says was the Calgary ’88 Olympics as a broadcaster and a volunteer. If you have ever been involved in the Olympics then you know how cool and crazy that experience is. Jacquie says in Calgary she met many important friends and mentors like Dean McLean, David Brindle, Marilyn Denis, Gayle Zarbatany, Kathy Thompson and 365’er Chris Kennedy. Next she was off to Toronto to work with the RAWLCO team led by Keith James. She helped with the launch of that new Country station CISS FM and worked on-air in the morning show with Larry Fedoruk and 365’er Cliff Dumas who she calls amazing. Vancouver came calling and that’s where she met her next mentor and friend George Gordon who she can’t say enough good things about (me either). 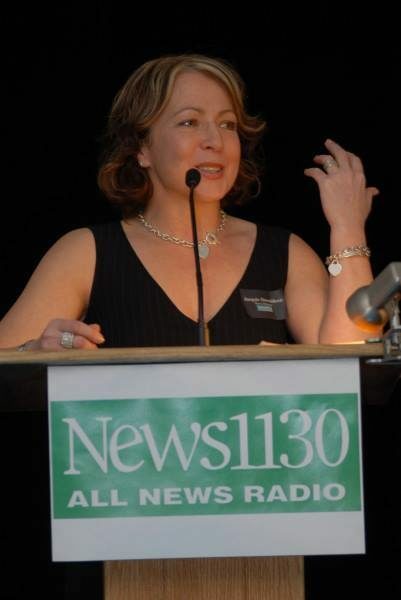 She became News and Program Director at CKWX News1130, and ran that place like a top. From a competitor’s perspective it was tough to gain an inch on them with her in charge. Jacquie left radio in 2009 after what she calls “a great ride”. She moved to the Sunshine Coast and is happily retired in Powell River. She is loving it and nice to see such a great reward for such a long time pro and leader in our industry. Atta be Jacquie! Very happy for you (and our business misses you!). Thank you, Jacquie Donaldson for being one of the “The Good Ones”. Feel free to like and share the Jacquie’s positive story. Who is the subject of tomorrow’s JJ-365 Salutes? As they say, stay tuned. I have had the privilege of working with this pro twice. First at 66CFR Calgary when I would fill in for Pete Montana on AM sports..Jacquie and Bruce Seely co anchored the morning news. Second — she helped me resurrect my career (along with Andy Ross, Larry Hennessey and Willy Percy at Jack FM/NEWS 1130 when she was my boss — I was doing mid days. I learned a lot which would help me when I reluctantly became a news director at 89.5 The Hawk Chilliwack and eventually launched FVN – Fraser Valley News, Sports and Entertainment. All that came from YOU JACQUIE..THANK YOU JD! xoxoxo. Anytime your story includes the late/great Jungle Jay Nelson, you’re in Hall of Fame company!